Hawaiian Flag from Iolani Palace, 1918. ANYONE KNOW OF THE ROYAL FLAG? This office [of the Kuokoa] was asked by the caretaker of the museum of antiquities at Kamehameha Schools, if perhaps there was someone who knew the whereabouts of the royal flag of Hawaii nei that was taken down from the flagpole of the palace when the rule of Queen Liliuokalani was snatched away, and being that there is no one here in this office who knows of the flag, therefore it is being asked before the public, and perhaps there is a Hawaiian who knows of the flag, or has heard of where it is kept. There are many Hawaiian flags, but the one that is greatly desired is the royal flag that was taken down on the 17th of January of the year 1893, which is 25 years ago; and the reason for this great desire to acquire this flag is that it will become something that will remind us of the history of Hawaii and her people. If there is someone who knows, or who has seen where this royal flag is kept, please inform the head of the museum at Kamehameha Schools, or this office. Ka Nupepa Kuokoa, Buke LVI, Helu 33, Aoao 3. Augate 16, 1918. More Gulick in Japan, 1871. Kobe, Japan, July 18, 1871. During this past month, that being June, I was caught up meeting with my youngest brother, John Gulick who lived as a missionary in China for seven years. He and his wife arrived on the 1st of June, and left for America and Britain to meet with their cousins, then they will go back to meet with the parents who are with you in Honolulu. Because of all the time I spent with them, my letter to you was not completed until the postal ship for June had already left. On the persecution of our students. I was about to hire a certain Japanese to teach me the language of this land on a regular basis. He stayed with me always, and returned home to his wife at nights to sleep. During school hours, he taught me, and when we were apart, he copied the books of the Gospel of Matthew, Mark, and John, which was translated into Japanese by one of the missionaries, but it was not published. This man named Einosuke lived with me for three months, and before this, he was a teacher for a fellow missionary, for one year or more. This Einosuke had some learning from the word of God and from our teaching. We had hoped that he had become a devout believer. He always held family prayer at his home, and he came to the morning services of my fellow missionary. In the evening of the 30th of June, this man and his wife were taken by the sheriff who was ordered by the governor of this city, and they were thrown into jail. Taken were the books of Mark and some other books which we left in the hands of this worker of ours. The other missionary and I sought hard for a means to get this follower and friend of freed from these people who were persecuting him. We asked government officials of the reason for our worker being jailed, but we were not told. We asked of the charges against him, but they did not answer in the least. It is clear to us what is his offense, that being his long association with us and his listening to the teachings of the kingdom of Christ. This is a major offense in the minds of the pagan officials, and to scare him and so that the people do not associate with us, this innocent man was taken and thrown in jail with his wife. This is the second week that they have been imprisoned, and it is not known when they will be released. Perhaps we will see their faces again; perhaps we will not see them again until they die. We pray fervently to God to give hope and to strengthen the faith of this man who is persecuted in His name, and to save him from the mouth of the lion. There was an announcement by the government recently, saying: “Obey dearly the laws pertaining to religion; and if someone speaks to another about Christianity with perhaps the intent to convert them to that religion, they should bring charges immediately before the government officials and make known the name of the person who tried to convert them.” Christ is the stone left behind by the house builders, but he is who shall be made the cornerstone. 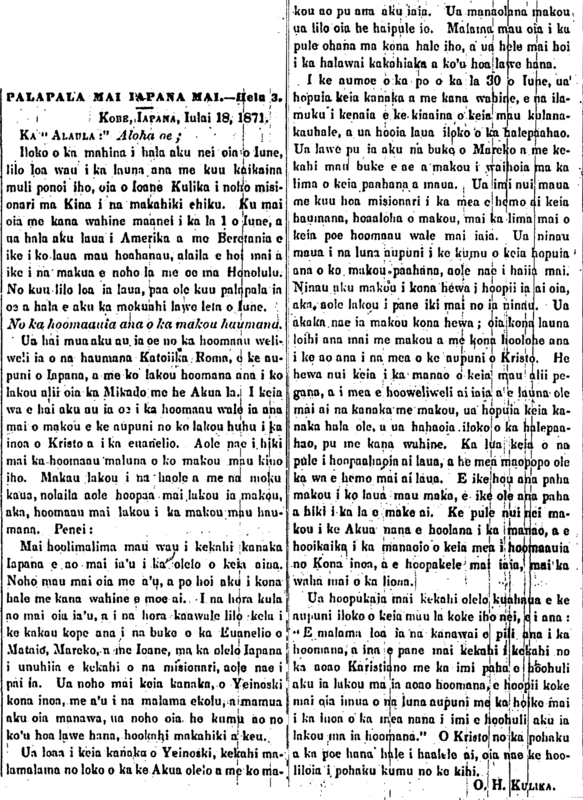 Ke Alaula, Buke VI, Helu 8, Aoao 30. Novemaba, 1871.